The Lord of vengeance, the strong one desires to settle accounts on your behalf today, raise your hands and your hearts and welcome Him. Your own case will be settled today. Good news, it is my joy and delight to let you know prophecies will be flowing, open your hearts and appropriate this blessings, God will be speaking into your life. Father we thank you, the first word we ever heard is YOU Bless us. Today is not an ordinary day; this is our Covenant Day of Vengeance. Does God should not avenge His very elect that cry unto Him day and night? Every attack of the enemy on you, the God of Vengeance will move in your behalf. In the Name of our Lord Jesus Christ. Let’s talk to Him, LORD today show yourself and move favorable in my situation. Proof Yourself as my God, intervene in my case, You alone are the ruler, the battle is yours, stand for I am your son, let the wickedness of the wicked comes to an end. Lord you fight for me and I shall hold my peace. Father we thank you, in Jesus precious name. We bless you! If it is not good, is not God, we serve a good God who always does good things. God will test you to upgrade you, but never temp you, all temptation comes from the enemy, he hates you because he will never be like you, you are created like GOD’s image, now in the new Covenant He is in you! If there is anything not good in your life – the devil has done it. At the time of harvest, HE will send His angels to pull out the weeds. Everything not planted on your life by God, it is coming finally today! Every one that has done this to you, they are being up rooted today! The God of vengeance is showing up in a spectacular way to some of you here today! Master didn’t you sow a good seed – how come there are weeds. The enemy has done this. Whatever the enemy has done to your children, to your grandchildren, to your business, to your ministry, to your career, to your marriage, to your health – against your divine destine, today the God of vengeance is fighting your cause! The God of vengeance is fighting for you. Thank you Father, blessed is Your Name. The breakthrough of the saints according to prophetic scripture, it is always preceding by vengeance, In Isaiah 61: 1:the prophet said: The Spirit of the Lord is upon me, He has anoint me to preach the good news of the Kingdom to the ones with open hearts. HE has SENT me #1.to bind up the brokenhearted, to #2. To proclaim liberty to the captives, # 3.To open the prison to those in it. In verse 2: # 4. To proclaim the acceptable year of the Lord. #5. The DAY OF VENGEANCE of our God. #6. To comfort all that mourn/grieve/lament/cry. Your comfort is not guarantee until vengeance in most cases – then breakthroughs will began. Vengeance set the pace for your breakthrough. That is why He said in Exodus 22:18 THOU SHALT NOT SUFFER A WITHCH TO LIVE, for it will continue do annoy you if he/she lives – curse them. So destroy him/her, the only way to stop his ministry is to curse them. How you kill them, with a curse. You have your order in His Word Exodus 22:18, you have His Name, you have the power of His blood, and you have Him in you. Who dares can be against you? The Day of Vengeance is part of Father established truth for your breakthrough. When Jesus opened the book, He stop at the ACCEPTABLE YEAR OF THE LORD Luke 4:18, that means the latter rain began with a DAY OF VENGANCE OF OUR GOD. We are in the center of the Day of Vengeance of our Lord. This day is declared a Day of Vengeance for all of you! Today you are not just going to be free; your captors will be destroyed. The ones slowing down your destine, will be destroyed. When the power of the Pharaoh was killed by a greater power, the people of God were free to leave. You are long overdue to live in this freedom! We serve a jealous God over you and me, with a great jealousy that is why today a day of vengeance in your favor. So you can enjoy the Blessing He has given you- some of you where free and prospering in the Lord, then you become lazy and was capture by the enemy – Today is your freedom day! Vengeance is mine says the Lord and I will do it! Isaiah 49:24-26 His vengeance is one proof He is our redeemer. There are some here that the devil has bow for them not to have children, others not to have grandchildren – those responsible are declared dead today. Some foul forces had determined for you not to enjoy your children, all those forces in whatever form in human entities and spirit entities are declare gone today. Some of you have move and move from one place to another, you do not develop roots in your career, that you do not reach the maturity in your calling – that source is visited by Divine Vengeance. Father said I will feed them with their own flesh; they shall drink their own blood as with wine. Father will destroy the source of your troubles. He said, I gave to you the former day moderately, but now I will bring the former and the latter rain together – not for you to sit and be merry, but to bring you great joy and enforce the Kingdom on earth, the time is short for the final judgment! I will restore to you the years of the canker worm had eaten. You shall eat in plenty and be satisfied, and my people shall never be ashamed. Praise be His Name! The latter day is design for the glorious era of the saints. The latter rain brings His Glory and His resurrection Power. Any forces that may try to build obstacles – will be destroyed. When you pull a tree that was planted to close to your house, you must take the roots out also, so in wont grow back in near future. Father is pulling the roots of that problem today! God vengeance is always with Divine Speed. Luke 18:7-8 today is that day! And we declare Yes L-d you will find Faith on the earth, here we are, come back L-d Jesus! Luke 18:7 Are you His elect? Have you cried day and night to Him, and said Father I will not give You rest until this matter is resolve! I am your child, promotion is passing me over – Father it is written I am the head and not the tail- Father Your Word keeps telling me Promotion comes from the Lord, show me where I am missing it? – I can see in Your Word, the first thing You said to man is a word of Blessing that contains glorious benefits that You have assigned to me! Father I cry to You, Show me Your way. If there is a human enemy or spiritual enemy – Father let your vengeance begin. No, I will not let You rest, until this Blessing that You have gave me is Restored! I know You are for me! Psalm 56:9…(read aloud) Enough if enough Father, restored to me what the enemy have stolen, Your Word declare when the thief is found, I am entailed to 7x of recompense, I am the one You love, I am in Jesus Christ, I invoke our Covenant – show Yourself strong in my behalf!!!!!!! Somebody’s cry is ascending to His throne now! Psalm 149:6-9 “Let the high praises of God be in their mouth, and a two-edged sword in their hand; 7To execute vengeance upon the heathen, and punishments upon the people; 8To bind their kings with chains, and their nobles with fetters of iron; 9To execute upon them the judgment written: this honour have all his saints. Praise ye the LORD. Give value to every word, and it will move from your head knowledge to your heart, where no one can take it again from you. 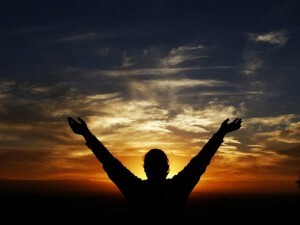 Let the high praises of God be in their throats and a two-edged sword in their hands. With a great boldness you Sing to the Lord your avenger, the sword is His Word, do not attempt to go to the throne begging or mopping, never exalt the enemy, only speak to Him His Word. Remember His eyes are looking to show Himself strong for those that Love Him, He is looking for God in You. Do not concentrate in the problem, speak, declare, and prophesy the solution to your problem. Make the enemy depress by your HIGH PRAISES to God. Because this problem is settle in heaven for ever. Paul and Silas praise, the force that was holding them in prison where shattered. David took off his kingly rob (no, he was not naked) and dance as a mere man to his God, in your high praises, you can clap – whistle –shout – make a pleasant noise to the Lord, when a baby makes funny sounds, it calls the attention of the parents, and they thinks every sound of their baby is just marvelous, is that truth? How much more Papa! I believe I will take it, I have it – it is my, Thank You Father, I forgive/I choose to walk in Love. This is powerful way to renew your mind, until Faith it is settle in your heart. When you declared: Your mind is involved, your will is exercised, your thanks giving is recorded and the rock of unforgivness is destroyed. Your Faith in God, a beautiful trust, provokes God’s vengeance and deliverance on His people Daniel 3:28, see how God took vengeance destroying the enemy Daniel 6:24. Faith builds in the heart and expresses thru your mouth. With the heart men believed and with his mouth his confession of what he believes into salvation/your rescue/your restoration. God whom we serve is able to deliver us, and He will. 2 Corinthians 4:13, Romans 10:10. God cannot keep silence, when you act on Faith. In Luke 18:8 He will be looking for Faith, when He comes back. Life and death are in the power of the tongue, one moment you are taking to God, and the next moment your child spills the milk and you say :”stupid child, you know we do not have money to buy more…” you just curse your child and declare the spirit of poverty as your possession. Keep your mind, your heart and your mouth at the Kingdom level, as is you move to China permanently you will have to learn the Chinese language, so apply yourself to learn the Kingdom Language, is called the Language of Faith. When Father dealt severely to disobedience, He curses –as when He did on the land, on satan, remember what Father said to Abraham, I will bless those who bless you, and curse those that cursed you. Genesis 12:3 the curse of the Lord is upon your enemies today. Mark 11-20-22 Jesus cursed the fig tree, it supposes to have fruit and didn’t –it wither away. Father cursed, Jesus cursed and the Prophet also curses. Learn more about His curses Deuteronomy 28:15-26.2 Kings 2:23-24 children where mocking the Prophet and were cursed. Today what is stopping, mocking your destine in God cursed ! Whatever is mocking your marriage, your children (drugs, alcohol), your career, your business, your ministry is entitle to the curse. We have power to bless and power to curse, when you walk with God, curses will not boomerang on you, because He is your defense, this is the heritage of the Sons of God. Today store called “dark ages” was cursed – not just given a command to moved or relocated, no, that store was an offense to God and was dealt with, is destroyed to never to open again. The power is in your faith, curse barrenness, pain, lack, poverty, confusion, stagnation, diabetes, cancer, arthritis, cast out dumb and deaf spirits out of your children. Get out of all disabilities. Return that Disable sign for your car, do not proclaim what you do not desire. The Lord says come out and come up, I am your only source! Who believes Him? Whatever this prophet curses today, will be cursed forever. No weapon form against you shall prosper. Every tongue that rises against your in Judgment – you shall condemn. Not me, you condemn = condemn to death, it and I confirm. Isaiah 54:17 . Your activity on condemning those things that are not of God in your life it is your responsibility to condemn, and God will confirm it. Today is a day of remove any and everything blocking your Shalom/Peace. God is watching you, and is ready to give you His confirmation, in the mouth of 2, it shall be establish forever. 1 Samuel 17:43-46 Some Christians when you are cursed by the enemy, you bless them,” pour souls they do not what they say, bless them Lord” – NO NO, it is time to condemn that evil spirit behind that soul, do not put up, do not allow it to live one second more…CONDEM send him to the DEEP SEA so you will not remember him no more, otherwise it will continue mocking you. That philistine cursed David by his god, David curse the Philistine by his GOD. God all powerful can do nothing in your behalf IF YOU ALLOWED IT, HE WILL ALLOWED WHAT YOU ALLOWED. Speak aloud, give voice! Curse your Goliath today! Curse your obstacle. Whatever is blocking you to leave at peace in your promise land it has to be cursed today! Someone is recovering his glorious destine right now! Is the Lord that bought you out, now open your mouth wide, tell Him what you desire of Him and He will do it. David prevailed without a sword in his hand, which means the Lord guided and give power to the stones David used. Now the Lord will confirm what you condemn. Your mouth is a switch to provoke divine intervention. I HAVE SENT FORTH THY PRISONERS OUT OF THE PIT WHEREIN (IS) NO WATER. God’s anger has come alive against your enemies today, fire for fire, in the Name of Jesus! The blood of Jesus is speaking on your favor today. Exodus 11:1 Exodus 12:31 all your enemies in a hurry are giving up right now, but is too late for them, we have condemn them and they will be at the bottom of the sea, where we will not see them again. There was blood by the door of the houses of His people in Egypt, now there is blood on your heart. You are the redeem ones, purchased by His precious Blood. Every arrow send to you by the enemy is send back to the sender. God vengeance is exclusive to the elect, if Jesus Christ is not yet your Lord and Savior come forward and declare you know He is for you, He die on the cross and seal with His own blood this covenant, is for all who needs Him as Savior, Lord. After He gave His life for our sins, He resurrected on the 3rd day and is victorious. If you have lost the way, and wandered of His path, repent and come forward. All of you pray in tongues and prepare your declaration to condemn that for which you will had enough! We take communion and rejoice in our Covenant…marking the end of struggles in your life. When you participate of this Covenant, eating His body and drinking His blood – all that is not of the Lord will be removed from your body, marriages are being restored, your family, your business, your ministry, your work places in the Name of Jesus Christ. (Take Communion). Today stagnation turns into celebration. What to do when Faith seems Weak?